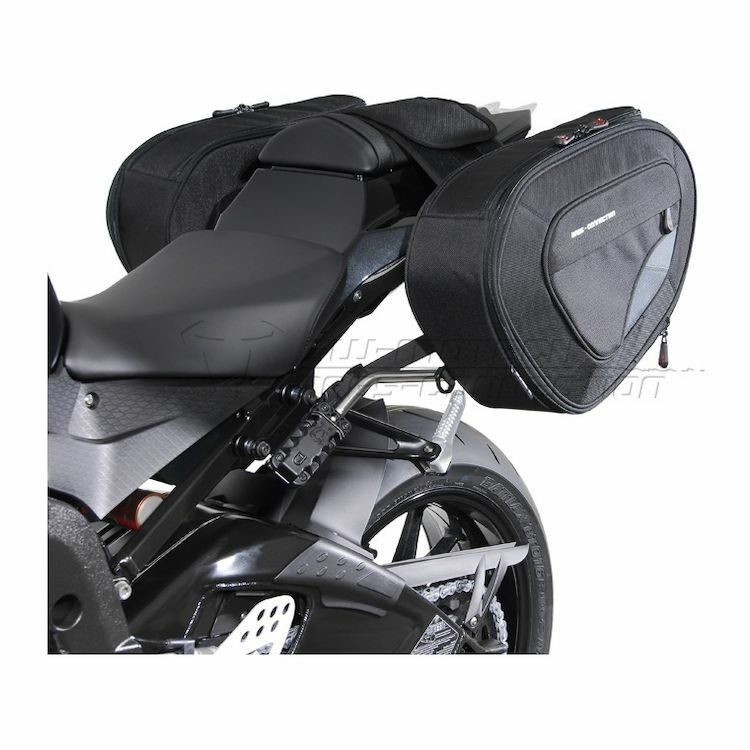 The Blaze Saddlebag System is a premium luggage option for sport bikes. Angular styling reinforced with semi-rigid paneling holds its shape at speed while quick-release support arms prevent exhaust and tire contact. The supporting arms click into minimalist brackets that bolt up behind your passenger peg stays. Once these brackets are in place, adding saddlebags for a weekend trip or weekly commuting is a matter of seconds. Just feed the support arms into channels behind each bag, then connect buckles. The bags top-load for convenience and feature YKK RC-Fuse zippers and 1680 ballistic nylon for durability. An expansion zipper bumps storage capacity from 14 to 21 liters per bag. This kit includes a set of Blaze Saddlebags plus bike-specific support arms and quick-release mounting brackets.